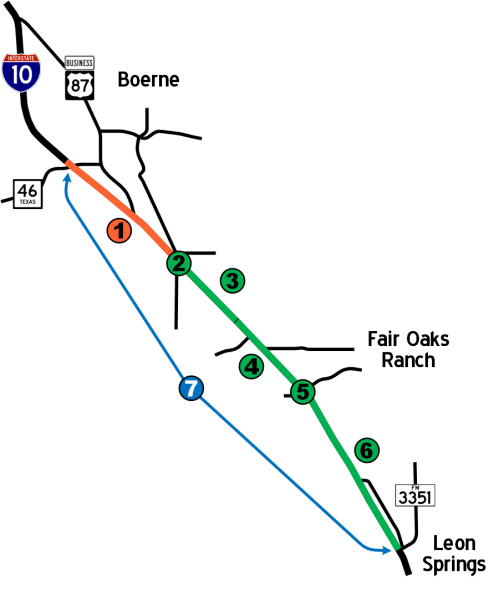 TxDOT has several recently completed, in-progress, or upcoming projects along I-10 West between Leon Springs and Boerne to improve intersections, add new overpasses, and convert the access roads to one-way operation. This page contains information about these projects. Note that none of these projects will add any new mainlanes to I-10 itself. Planning is underway for future projects to do that. None of these projects are related to the recent Kendall Gateway study. The schematics below are courtesy of TxDOT; the annotations on them are my own. This project will overhaul and redesign the interchanges at SH 46 (W Bandera Road) and at Business 87 (S Main Street), complete the westbound frontage road between Business 87 and Christus Parkway, convert all the frontage roads to one-way, and change the locations of the entrance and exit ramps. At SH 46, the overpass will be widened to two through lanes and a left turn lane in each direction. The access roads adjacent to the overpass will be re-aligned inward toward the mainlanes and portions of the old access roads at School St. and Upper Balcones Rd. will be converted to local service streets configured to minimize conflicts. A westbound to eastbound turnaround will also be constructed. Although not shown on the schematic, the park-and-ride lot will be kept in its current location but reconfigured. The Business 87 interchange is being rebuilt as a more conventional intersection. A new, wider overpass will replace the existing overpass and will end in a "T" at a realigned eastbound access road. There will be turnarounds for both directions. A new westbound access road will continue beyond the new intersection and join with the new frontage road recently completed near Christus Parkway. The existing entrance and exit ramps will be relocated further south from the intersection. A portion of the existing westbound access road at the southeast corner of the interchange will be converted to a service street to maintain access to local properties after the access road is realigned. At Scenic Loop, an eastbound to westbound turnaround will be built and the entrance and exit ramps north of Scenic Loop will be relocated further north. This project will convert the access roads between Scenic Loop Road and Balcones Creek Road to one-way, relocate the entrance and exit ramps further south and construct new entrance and exit ramps for Balcones Creek Road, and construct new higher access road bridges over Balcones Creek. The existing "lower" access roads and crossover under I-10 at Balcones Creek will be kept. 3 Kendall County Line to Fair Oaks Ranch Blvd. A future project will add turnarounds in both directions, move the entrance and exit ramps, and convert the access roads to one-way. The overpass has been widened to five lanes and realigned to join Fair Oaks Parkway to Tarpon Drive. The access roads south of Fair Oaks Pkwy have been converted to one-way and the entrance and exit ramps relocated as part of project #6 below. The future project at Balcones Creek Road (above) will then convert the access roads north of Fair Oaks Pkwy to one-way and relocate those entrance and exit ramps. Q: Why are the new entrance and exit ramps being removed? Q: Why wasn't the eastbound to westbound turnaround built at the same time as the other turnaround? A: Because that's being built as part of a separate project (#3 above.) That turnaround requires the access roads north of Fair Oaks to be one-way, which is being done as a separate project in conjunction with a new overpass at Balcones Creek Road. The schematic for this project is included with the schematic for #5 below. A new overpass for I-10 has been built at Old Fredericksburg Road connecting it to Buckskin Drive. The access roads have been converted to one-way, new entrance and exit ramps for this intersection added, and the exit and entrance ramps for Ralph Fair Road/Boerne Stage Road relocated. Q: Why are the signals at the new Buckskin/Old Fredericksburg intersection flashing red? A: These signals were installed for future use at this intersection, i.e. planners know they will be needed in the near future as traffic grows here, so it was more cost-effective to include them in the overpass project than to have to come back later and install them. For the moment, traffic volumes only necessitate a four-way stop, so the signals are used to supplement that. Engineers are monitoring traffic at this intersection and will switch to full red-green signal operation when traffic volumes warrant. Q: When the access roads changed to one-way, why was only one lane open for the first couple of weeks? A: This was done as a safety measure while motorists got used to the new one-way pattern. By blocking the former opposing lane, drivers were forced to go the correct direction. The "new" lane was opened the week of October 1st. Q: Why weren't all the new ramps opened at the same time? A: Two of the new ramps are at the location of the ramps south of Fair Oaks (see schematic for #5 above) and two more are located where the former ramps north of Ralph Fair were, so those ramps had to stay open and the new ramps at those locations couldn't be built until the replacement ramps at the new locations near Buckskin/Old Fredericksburg were open (think of the game where you have to move the numbered squares around to get them in order but only have one open square to work with.) Furthermore, those new ramps, because of their alignment, couldn't be opened until the access roads were one-way. To be able to have opened all eight new ramps at once would have required closing the four old ramps at Fair Oaks and at Ralph Fair for several weeks before the other ramps opened. This would have forced all NB traffic headed to Fair Oaks to exit at Ralph Fair Rd. and use the access road for that entire distance (and the same for SB traffic coming from Fair Oaks) and would have forced all SB traffic headed to Ralph Fair to exit at Fair Oaks and follow the access road that entire distance (and the some for the opposite direction.) It should be obvious how bad of an idea that would have been.